HIPAAEx works directly with you to build a HIPAA Compliance and Cybersecurity program that aligns with your budget, vision and overall risk tolerance. We protect your patients’ PHI, while best preparing you for a potential audit. Discover the less complicated, more cost-efficient path to compliance! YES, I WANT HIPAAEx TO HELP ME WITH HIPAA COMPLIANCE AND SECURITY Tell me more! This Risk Analysis must satisfy HHS/OCR requirements and can include the following NIST SP 800-30, -39, -53, -66, -100. ISO/IEC 27001 can also be used dependent on size of organization and risk levels. There are no shortcuts or ways around this mandatory step of completing a comprehensive HIPAA Risk Analysis. This non-conformance is the #1 audit finding that results in fines. This Corrective Action Plan is your roadmap that provides a step-by-step guide to what needs to be done, when it will be done, who is responsible for getting it done, why it is being done and how it is being done. The risk analysis determines what needs to be done and the priority. This document is mandatory. Documentation is critical to achieving and maintaining compliance, being prepared for an audit and gaining maximum benefit from your cyber program. The HIPAAEx team can manage this entire process while you focus on your business with the assurance that it is being done to industry best standards. We implement, modify, tune and configure your existing security infrastructure to meet your organization’s needs. Our recommendations may include healthcare compliance software and other products from our carefully chosen technology partners. However, we will never recommend a solution or HIPAA compliance tool that you don’t need. This transparent, no-fluff approach will help you save as your practice implements key components of HIPAA compliance. As a small business, we specialize in helping small businesses achieve HIPAA compliance – but we perform within a tighter scope. HIPAAEx isn't the enterprise-level outfit designed to serve conglomerates. We’re the firm dedicated to solving the problems you face on a daily basis and having your back in case larger-scale problems arise later. That means you get a uniquely personal level of service from experts who have been in the industry a while. We’re not in the business of scaring you with the ideas of a million-dollar data breach. While we help protect you against those threats, we’re really here to help keep you free from HIPAA violation penalties that you’re much more likely to face someday. For small practices struggling to achieve compliance, we’ve customized the cost-prohibitive high-end enterprise solution – without cutting corners – while still delivering exceptional value and real results. This means your practice gains all of the functionality you need without the bells and whistles you don’t. HIPAAEx is an ideal partner for small healthcare practices. 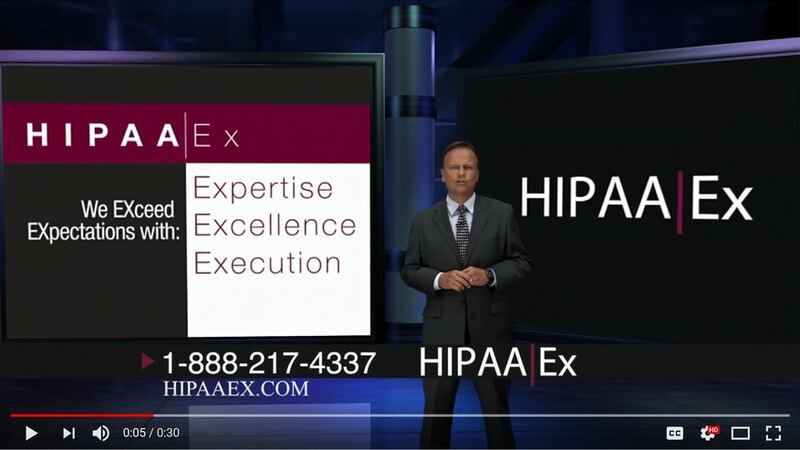 Healthcare practices choose HIPAAEx as a partner because we offer a detailed, cost-effective model to assist in identifying and preventing the threats to the confidentiality, integrity and availability for your ePHI. Our team of risk management experts will provide a complete governance, risk and compliance analysis with a customized, common sense approach to what is “reasonable and appropriate” for your firm. HIPAAEx is thorough. We are timely. And, above all, we have the best interest of your small business at heart. YES, I WANT HIPAA PEACE OF MIND NOW!